Unless you’re a roller coaster enthusiast, curious foreign traveler, or local resident Coney Island isn’t high on most people’s tourist agendas. Lots of people outside of greater New York aren’t even aware that a newly christened Luna Park opened in 2010 or that minor league baseball’s Brooklyn Cyclones play in the shadow of one of the park’s two roller coasters. For over 150 years, though, Coney Island was the place to be seen (or in some cases, a place not to be seen). A delightful new exhibit at Hartford’s Wadsworth Atheneum uses paintings, graphic art, film clips, postcards and other objects to show us Coney Island in its many guises. Curator Robin Jaffe Frank’s exhibit is so thoughtfully arranged that wandering among its 140 pieces is akin to being in a living time capsule. 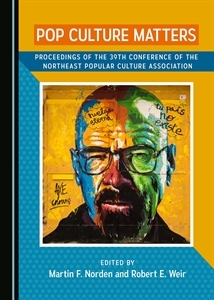 For pop culture scholars, it’s a textbook case of how to connect art, society, and history. Coney Island has indeed been a “Dreamland,” which was also the name of the area’s third major amusement park. Coney Island’s name derives from the rabbits that were the major residents in the days when Brooklyn was a separate city and still had working farms. The exhibit’s first section, “Down at Coney Island 1861–1894″ takes us back to the years when the first development took place there. It was, as we see in paintings from Samuel Carr and John Twachtman, not a place for respectable Victorians. It was remote–just as gamblers and the sporting crowd wished it to be–”Sodom by the Sea” as some critics dubbed it. As we move to the next section, “World’s Greatest Playground 1895–1929,” we see Victorian outrage as the dying gasp of moralists whose cultural style was about to be eclipsed by Modernist sensation seekers. When George Tilyou opened Steeplechase Park in 1897, stern Victorianism was no match for mechanical horses, roller coasters, circuses, and fun houses. Reginald Marsh first painted Coney Island during this period, and only his death in 1954 deterred Coney’s most prolific canvas chronicler. We find all manner of wondrous objects in this section–Tilyou’s creepy funny face icon, gambling wheels, carousel horses, Walker Evans’ photographs…. 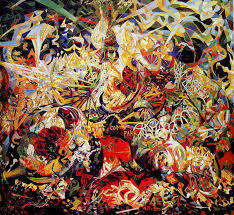 But if one had to sum the cultural transformation in a single image, Joseph Stella’s “Battle of Lights” (1912–14) would serve well. (Pictured above) It’s a literal swirl of sensations, the likes of which must have dizzied early Modernists on the Tilt-a-Whirl ride. Think of the awe that those who grew up with gaslight must have felt when Dreamland opened in 1903 and workers threw the switch on 250,000 electric lights. Actually, you don’t have to imagine; an Edwin S. Porter film shows us. The Great Depression (and several fires) forced Coney Island to reinvent itself as “The Nickel Empire 1930–1939.” Marsh was at the height of his powers then, but his images–and those of others including Harry Roseland, Paul Cadmus, and Lisette Model–show us that Coney Island was inexorably losing middle-class patrons as it became a refuge for those seeking cheap amusements. The last two sections, “Coney Island of the Mind 1940–1961” (a riff on Lawrence Ferlinghetti’s 1958 poetry collection) and “Requiem for a Dream 1962–2008” (after Darren Aronofsky’s film) show Coney Island in decline–from the working-class bastion photographed by Weegee, Diane Arbus, and Gary Winogrand to a seedy relic from another time. Astroland opened in 1962, but Steeplechase closed in 1964. By 1975, New Yorkers were warned to avoid the subway to Coney Island, by then a repository of crime, grime, freak shows, and drugs. Even before Astroland folded in 2008, Lisa Kereszi’s squalid photos captured Coney’s coming demise. A revival might be in the air. The Cyclone–built in 1927–remains standing and within eyeshot of a spanking new Thunderbolt. Hurricane Sandy did the area no favors, but the baseball team is popular, the annual “Mermaid Parade” continues to draw massive crowds, 35,000 people show up for its July 4 hotdog-eating contest, and it’s still cooler on Coney Island’s crowded beaches than in a fifth-floor walkup. At present, though, Disney dominates the theme park social imaginary, Coney Island isn’t among the nation’s twenty top grossing regional attractions, and its two amusement parks (Luna , Deno’s) combined offer a third fewer ride thrills than Pennsylvania’s Hershey Park. Small wonder that so many scholars and writers (John Kasson, Michael Immerso, Charles Denson,Kevin Baker, Sarah Hall, Stephen Millhauser, Alice Hoffman) dwell on its storied past. Before Disney there was Coney Island. It will surely remain vivid and vital in the memories of anyone venturing to Hartford to see the exhibit.